If you thought white environs only serve to make a space look sterile or clinical, then you are in for quite a style surprise! 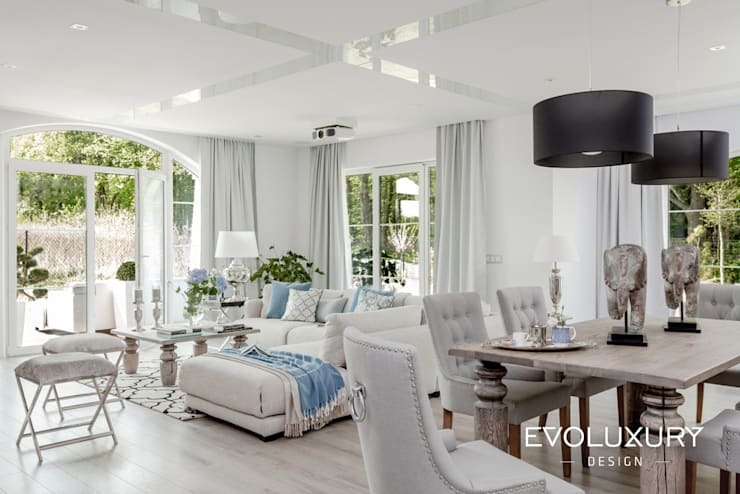 This home called White Calm has been rendered predominantly in white and grey by the interior architects at Evoluxury Design in Wroclaw, and it is quite a stunner. The sprawling Polish property exudes countryside charm surrounded by lush green lawns, and is filled with cozy and soothing touches. The interiors feature soft blue and wooden accents besides splashes of white and grey, while modern and elegant designs transport you to a world of understated luxury. The residence not only enjoys the sunny and airy presence of large doors and windows, it embraces indoor greens and fresh blooms for a nature-friendly and welcoming vibe. The classic good looks of this cottage also play around with modern lines and cuts, as well as stylish construction materials which create a more fitting urban statement. Surrounded by verdant and manicured lawns, the home is a single storey one with slanting rooftops lined with grey metal shingles and white walls. The glass doors and windows as well as the pillars of the porch make it all look quaint and charming despite the modern touches. The home is set with angles forming nooks and corners as you take a walk around it. The pretty porch of the home has upward tapering pillars in whitewashed bricks while a wide arc sits below the slanting roof for quaintness. The chimneys make for a whimsical effect. The pretty living room flaunts layers of white with pastel blues ensuring that it also has plenty of colours. The arched door at the end of the room as well as the door on the right brings in lots of natural light. The L shaped cozy sectional in white and the classic stools with crossed chrome legs in front sit around the large coffee table. Behind the stools, you will find a modern fireplace with a hint of black and a lattice work vintage style mirror leaning on the mantelpiece. Greenery, patterns on the cushions and throws, decorative candles, and beautiful lamps and vases make the white scheme come alive. The dining room has a farmhouse style table with a reclaimed wooden finish, while the classic upholstered chairs stand around it in lavish white. The chairs feature door knocker style accents in silver on their backsides for easy mobility. Contrast cylindrical pendant lights in black shed a soothing glow over the table in the evenings, while carved wooden pieces lend an artistic look to the setting. Gleaming crisscross strips on the ceiling add panache to the living and dining areas too. 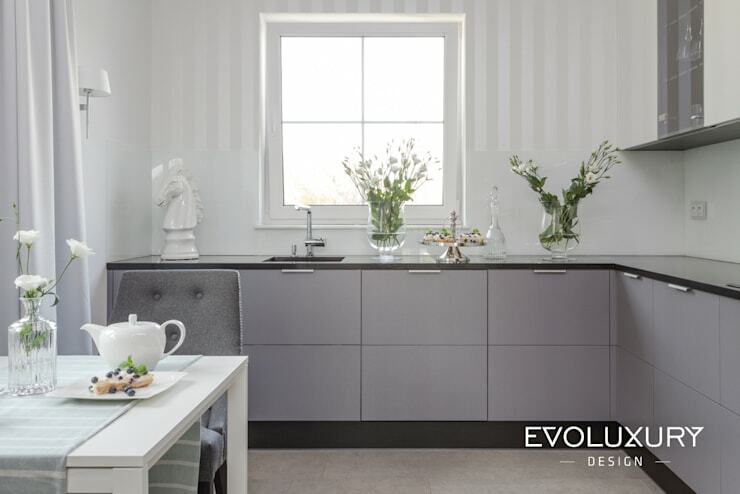 The grey matte finished cabinets ensure that there is a defining modern look in the kitchen, while they cater to easy storage. The white table in front with the charming glass bottle for flowers and a white teapot keep the country charm of the house going. Striped wallpaper makes a homely and sophisticated statement here, while fresh floral greens bring the bounty of nature inside. 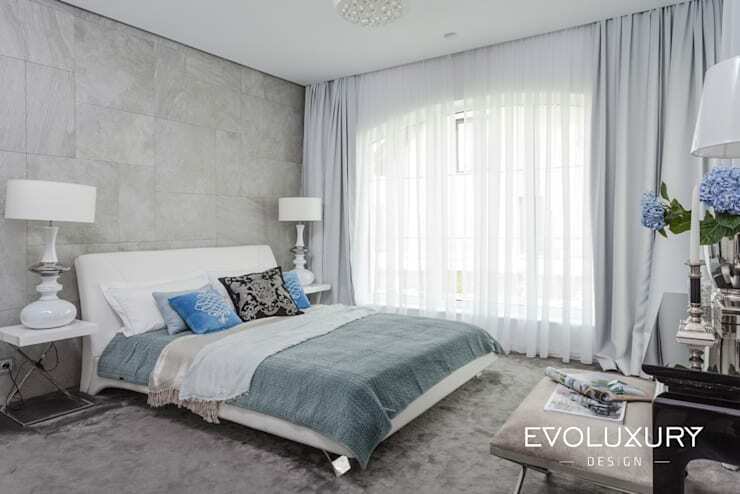 White takes on complementary hues like grey, silver and blue to give the bedroom a calming and elegant feel. You can easily zone out in this room with its satiny white drapes and textured stone wall behind the headboard of the large and plush bed. The large table lamps on either side also render a luxurious feel to the space, while the dressing unit freshens up with lovely blue flowers. The stylish white bathroom has simplicity as its forte with glass partitions and a whimsical blue stool. 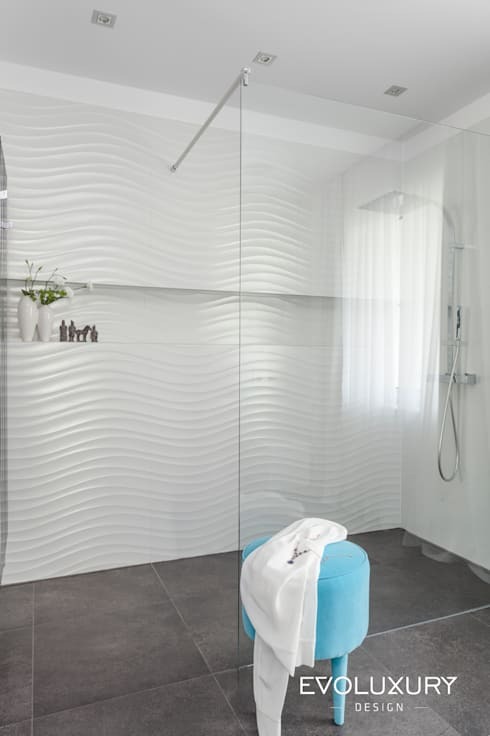 The textured wall flaunts wavy patterns and a sleek niche for arranging toiletries, while minimalistic fixtures and a cool grey floor keep things chic and contemporary. 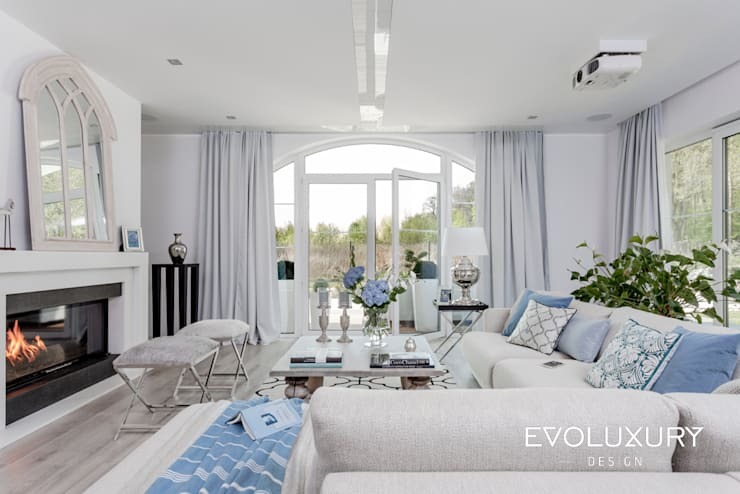 With its lavish use of white, grey and blue hues, this modern villa oozes with tranquil countryside appeal. Sleek and elegant designs blend with tasteful decor and cozy textures for a homely yet fashionable ambiance. Take another tour for more ideas - The Charming Cozy Nest for Two.